Translated by Ariel Godwin. Edited by Joscelyn Godwin. German Edition 1950. English Translation 2006. 630 pages, 485 illustrations. Amendment to the text (§45.3): For this color table, the reader will find the 6 primary and secondary colors pasted in, besides the printed gray-values-a verbal designation of the colors of the fields would therefore be superfluous. Admittedly, the reader must complete the table by pasting in, or drawing with colored pencils, (1) the identical color-tones, and (2) their upper (brighter) and lower (darker) octaves. The model for how to proceed here is given by the c-values already printed. For example, the identical 1/1 c-values of the generator-tone line are all the same medium gray, the identical 2/1 4/2 8/3 8/4 ... c-values are a lighter gray than the next octave up, and so forth. The 6 basic colors should be developed upwards and downwards in the same manner. If the tone 2/3 f, is a medium bright green, then the identical tones 4/6 f, 6/9 f, 8/12 f, and 10/15 f, will be the same shade of green, the next octave up 4/3 f will be a somewhat lighter green, and the next octave down 1/3 f,, a somewhat darker green-and so on. It will be very enjoyable for the reader, then, to locate all the colors by means of the rays of the “equal-tone lines” on the monochord string starting from 0/0. This analysis represents only one attempt to coordinate color and tone. I have not as yet been able to persuade myself of an absolute connection between “this” tone and “that” color. Just as every person is tuned to a certain tone, every color can, in my opinion, be identified with a “generator-tone,” according to the various individualities of the being-values. If 1/1 is defined, the arrangement of the tone-colors among themselves is something different. If, for example, I identify 1/1 c with red, then all the following tone-color or color-tone arrangements will proceed within the “P” system; admittedly, a few variables must be fixed: which is “blue,” which complementary, etc. Here we will discuss only a single problem for a future harmonic study of color, namely the color analysis of the partial-tone coordinates. The reason this is undertaken only here, and not in earlier sections (such as in §20 or §21) regarding the “P” itself, is connected with the type of analysis. Specifically, we will use only one element of the “P” for our color analysis, namely the “interval constants” of this chapter-title. For a correct understanding of our analysis, a brief account of the Goethe-Schopenhauer-Newton situation is necessary. Since Newton based everything upon an exact physical foundation of color, whereas Goethe based everything upon a physiological and psychological characterization that was as all-encompassing as possible, it is not initially understandable why Goethe argued so acrimoniously against Newton. Both viewpoints, right up to modern times, are well founded alongside each other, and one might think that neither stood in the other's way. It was not possible 100 years ago to bring Goethe's extremely precise and conscientious analyses and observations physically to a norm, and Goethe did not succeed in unifying his views with Newton's equally meticulous experiments. Thus Goethe became an embittered opponent of the Newtonian “heresy.” Our high esteem for both geniuses today forces us to ask the question: shouldn't a reconciliation between both views be possible? The main quarrel, as is known, centers around the fact that Goethe and his adherents say that color is an appearance “on” light, i.e. it is actually only generated in our eyes, in the retina; whereas the Newtonians, and modern physicists with them, claim that color is a function of the wave-lengths of individual light rays, and thus is already present a priori in the nature of light. Goethe did not completely repudiate the spectrum, although in accordance with the current state of research he ascribed no great value to it. I am sure that if Goethe could have seen with his own eyes the marvel of polarization phenomena as perfected today, and learned of the improvements in spectral analysis, he would certainly have changed his opinions and tried to bring his ideas into agreement. So Goethe was undoubtedly wrong there. Holding this single point against all of Goethe's studies of color would reduce him to nothing, especially since he did not touch upon the essentials of this study at all. But in one place, Goethe's intuition hit the right spot: The world of colors emerges between light and darkness, and the nature of color itself is polar. One is easily tempted to say that this intuition transgresses the bounds of science. But if one perceives both these theses in all their power and depth, one will sense how far they penetrate the innermost areas of nature and art. Modern science, however, has no need of that. The spectrum itself appears in colors out of the darkness, and returns to darkness; and the fact of the “subjective” complementary colors is at least so incontestable psychologically and so well established physiologically (as Herr J. Itten of Zürich told me, complementary shadows in color can be photographed objectively!) that there can be no talk of a repudiation of this polarity on the part of science. Besides, Goethe relinquishes the main problem that has occupied all of scientific optics since Newton-namely, a mathematical foundation of the phenomena of color and light-although he does not in any way consider it impossible (see Farbenlehre, “Didaktischer Teil,” §722 ff.). These two main ideas of Goethe's are completely harmonic. Envision the tone-development as it groups itself in the partial-tone coordinates around a center, the generator-tone, upwards (to the light) on one side and downwards (to the darkness) on the other side; consider, further, the dual construction of the tone-system, in which each tone has its complement in its reciprocal (3/5 es ↔ 5/3 a etc.) and all the ratios together emerge from two opposing impulses. This is the exact counterpart, in tonal studies, of Goethe's basic view. In my “Tonspektren” (Abhandlungen), this polarity is brought to the same basis as that of the optic spectrum. Admittedly, the exact link between the two opinions is missing, because the arrangement of spectral colors differs from Goethe's and Schopenhauer's ordering of their color-evaluation. But this deficit is not the fault of Goethe's followers, but of modern science, which despite many energetic attempts has not yet been able to provide a natural mathematical rationale for color studies. Here, also, harmonics can be a competent mediator, simply because it has a number-form at its disposal in the tone-number, which is firmly rooted in a sense coordinative to the eye (the ear), and is simultaneously anchored in nature (partial tones). In Hörende Mensch, and in the abovementioned “Tonspektren,” I attempted to show how we can use this tone-number to undertake a harmonic analysis of light as the generator of color. Since every spectral line marks a specific color, this may lead us to a standardization of color that is not abstract and artificial, but in accordance with color, and thus visual and natural. However, a connection is evident, in that the spectrum exhibits the reversed series-progression of the Schopenhauer series in its second half. Both series are well-founded, the first psychologically, the second physically. I will now place Schopenhauer's pairs of colors in the partial-tone coordinate scheme according to their evaluation: (1) green-red, (2) blue-orange, and (3) purple-yellow, assuming that the overtone basal series 1/1, 2/1, 3/1 ... approaches the light (white), while the undertone basal series 1/1, 1/2, 1/3 ... approaches the dark (black). The diagonal 1/1, 2/2, 3/3 ..., i.e. the generator-tone, is a medium gray, in which all complementary colors dissolve before our eyes as they are mixed. The identical tone-values (equal-tone lines) always contain the same color, the octaves upwards are always the next step towards white, and the octaves downwards are always the next step towards black. All generator-octaves thus have gray-values, upwards approaching white, downwards approaching black. G and F appear in the tone-development as the first tone-pair differing from the generator-tone. In accordance with Schopenhauer's view, they should have the colors red and green (or vice versa; but I chose the colors according to their brightness-value, placing green, blue, and purple in the < 1 domain, and red, orange, and yellow in the > 1 domain), and in their upper and lower octaves, the corresponding brighter and darker values of red and green. E-As and A-Es appear as further reciprocal tone pairs. From the above viewpoints, and because E and As appear first and closest to the generator-tone, these tones receive the colors blue-orange; and the tones A-Es receive the last color pair purple-yellow. The brightness value of the color is always defined so that the “purest” colors, i.e. those with the highest saturation, lie next to the central diagonal 1/1, 2/2, 3/3. Naturally, any number of other colors-even an endless number-can be inserted between the above six colors, and will appear and require places in further tone-development. For the sake of clarity, only the color-values of these 6 colors are inscribed, along with the gray values with their upper and lower octaves. I recommend that the reader draw Table 442a himself in color according to the specifications given. It would be better to leave the table in this book as it is, to draw a grid of lines on a large sheet of cardboard, and to fill out the corresponding fields with gray and color values. If we now observe the parallel series lying next to the diagonals 2/1 3/2 4/3 5/4 6/5 ... and 1/2 2/3 3/4 4/5 5/6 ..., we see that the colors green, blue, and violet appear in 4/3 5/4 6/5, and red, orange, and yellow appear in 3/4 4/5 5/6, with a pronounced color-harmonic direction of the two series toward the middle line n/n - 1 = gray. It is interesting to note the switching of red and green in the two previous steps 2/2 and 3/3, which cannot at present be interpreted purely physically. The substance of the experiment, however, is shown by the fact that the overtone and undertone parallels of the middle diagonal from the ratios 3/4 and 4/3 upwards show a definite spectral structure, whereby the division of the spectrum between red and green remains, for now, yet another physical puzzle. But perhaps the spectrum is not a homogenous band at all, but is superimposed from two impulses, beginning with yellow and green (emerging from a gray stage) or touching each other? In any case, we see that a harmonic analysis of the Goethe-Schopenhauer color arrangement leads to a spectral arrangements, albeit of a rudimentary type. Otherwise, our table shows that every color-complement corresponds to an exact tone-complement, and thus, regardless of its physical significance, the table is useful as a color-tone designation table, which even in this small version clearly illustrates a great number of color-chords, color-intervals, and color-tone steps. It is mentioned here only as a side note that a color-body can be developed on this basis analogously to the partial-tone cube, and Runge's color-sphere and similar spatial color constructions are well worth contemplating for their inner logic. Perhaps this “tone-prism” will shed light upon the entire polarization problem, and lead to a connection with spectral analysis. For 3: As the most pertinent published work, predominantly from the standpoint of the artist and pedagogue, I recommend Johannes Itten's great work on color, published privately at the beginning of the 1920s, which will hopefully soon be made generally accessible. Furthermore: Carry von Bienna, Farben und Formen als lebendige Kräfte (Jena, Diederichs), a student of Adolf Hötzel who offers Hötzel's lessons as a whole and expounds upon them; Wilhelm Steinfels: Farbe und Dasein (Jena, Diederichs, 1926); the writings of the Swiss painter Aeppli: Die Symbolik von Licht und Dunkel. Die Farben und ihre Offenbarung, self-published, Uerikon am Zürichsee 1936, and Lebensordnungen, Farbe, Ton, Form, Emil Oesch Verlag, Thalwil-Zürich 1944. Aeppli's works discuss color problems from the religious-symbolic viewpoint. In the latter work Aeppli analyzes the partial-tone coordinates in his own way, using red and yellow as the generator-tone 1/1. 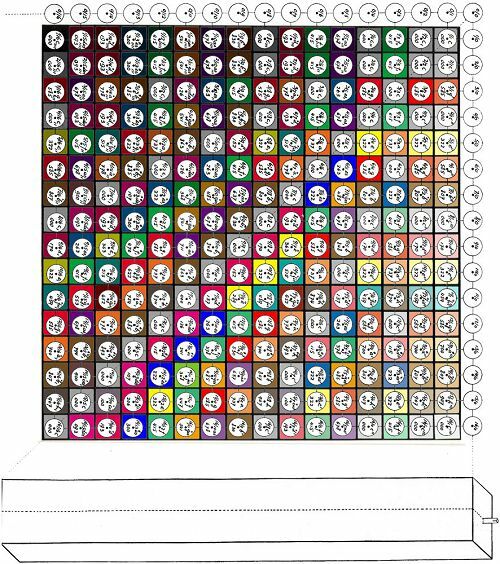 Victor Goldschmidt, on the basis of his crystallographic-harmonic complication law, has published a tabular-work on color that I have not yet been able to obtain. A rich bibliography on audition colorée can be found in Georg Anschütz, Farbe-Tonforschung I (Leipzig 1927), from whose school the dissertation of Johannes Hantzsch: Farbe-Formbeziehung bei Kindern und Jugendlichen (Hamburg 1935) also originates. Besides the well-known books by Ostwald (Farbenlehre und Farbenfibel), a good popular-science discussion of the color problem is in William Bragg: Die Welt des Lichtes (Braunschweig, Vieweg, 1935). I cannot further discuss Aeppli's beautiful and religiously founded main work, Lebensordnungen, since I obtained a copy of the book from the friendly author only after the completion of this manuscript. But the reader interested in color-tone problems is referred all the more urgently to this book. * Translator's note: In the original edition, Figure 442a consisted of a black-and-white grid onto which 6 colored squares were pasted by hand-indicating the colors for the 6 tones g, (red), f (green), as, (purple), e (yellow), a, (orange), and es (blue)-covered by a transparent overlay showing the field of partial-tone coordinates up to index 16 and the monochord. In this translation, we were able to complete Figure 442a in full color as Kayser intended, but could not include the transparent overlay; therefore we show the colored background grid with the “P” field placed over it. For reasons of completeness and clarity, we have included all Kayser's original instructions on how to color the diagram.